If Maine lobsters and clams steamed in a pile of rocks and seaweed, dipped in melted butter, and served with hot corn on the cob sounds good to you, get yourself to a Maine lobster bake. There are a number of ways to experience this traditional Maine summer meal, from hiring a caterer to doing it yourself to embarking on a Maine coast cruise aboard a historic sailing ship. To do your own lobster bake (or more accurately, a "lobster steam"), you'll need a large galvanized washtub, some rocks, saltwater and seaweed. Place the washtub on the rocks about a foot off the ground, and build a wood fire underneath. Place two inches of saltwater in the tub, and bring it to a rapid boil. Add the lobsters (bought fresh the day of the bake from one of Maine's fresh-caught lobster sellers like the Pine Point Fisherman's Co-op in Scarborough), and cover with two inches of seaweed. Add the clams and mussels, and cover with another thin layer of seaweed. Place the corn on the cob on top, leaving some of the husk on the ears. Cover with seaweed. By this time, you should have a roaring fire going. Place butter in an empty coffee can, set it next to the fire, and allow it to melt. Boil everything for approximately 20 minutes. Don't overcook. Lobsters are done when they turn bright red. Clams and mussels are done when they open. A lobster bake is best enjoyed on a beach (make sure you don't need a permit for the fire), but it's easy enough to do in your own backyard. If you want somebody else to do the work, consider hiring a Maine-based caterer. Foster's Downeast Clambake in southern Maine has served their Downeast Clambakes worldwide, including a clambake for Congress served on the White House lawn and a clambake at the Pentagon. Their famous clambakes feature a prize-winning chowder, cultivated mussels, freshly dug steamed clams, Maine lobster, fresh corn on the cob, roasted red bliss potatoes, roasted onions, hot drawn butter and Maine blueberry crumb cake. A barbecued half chicken or vegetarian option may be substituted for the lobster, upon request, and a children's menu is available. Foster's will prepare and serve a clambake at your location or theirs: Choose from three available venues. Coastal Critters Clambakes serves basic, standard and deluxe lobster bakes at the location of your choice in Maine, New Hampshire or Massachusetts. Standard bakes include whole Maine lobster, steamer clams, smoked kielbasa, corn on the cob, homemade potato salad, coleslaw, fresh bread, fruit and beverages. They've been delighting lobster lovers for more than 40 years. 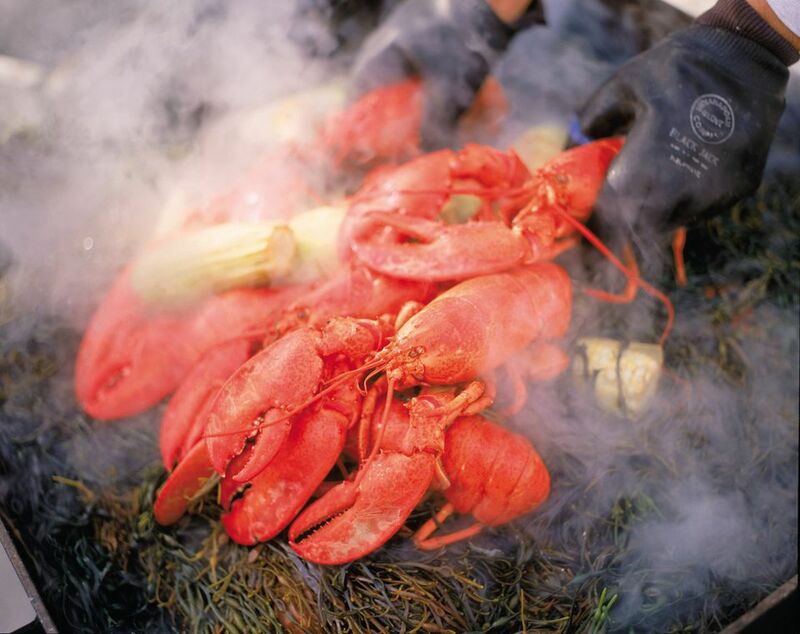 Yarmouth, Maine-based Finest Kind Caterers has appeared on Bobby Flay's Food Nation program on the Food Network, and the celebrity chef's rousing endorsement makes this caterer an excellent choice for traditional Downeast-style lobster bakes. They'll bring everything to your location and steam Maine lobster, clams, potatoes and corn on the cob in a blanket of seaweed over a smoky wood fire. Hire Cathy's Lobster Bake, and you're in for an authentic Maine experience. Cathy's husband, Paul, has been a lobsterman for nearly 30 years. The lobsters they provide are caught daily, and their clams are hand-dug. You provide the location, and they'll provide the deliciousness. For many Maine travelers, the ultimate lobster feasting experience occurs during a cruise aboard one of the legendary, tall-masted sailing ships that still grace the waters off the state's rugged coast. The eight ships that make up the Maine Windjammer Association fleet are all distinct, and the courses they chart are at the whim of the winds. But there's one thing you can count on during every cruise: a traditional Maine lobster bake on a stunning island. You haven't truly lived until you've sat on a beach waiting for pounds and pounds of lobster to turn red and ready for devouring. These lobster bakes are all-you-can-eat, and as the sun sinks, you'll wish you had a backup stomach.